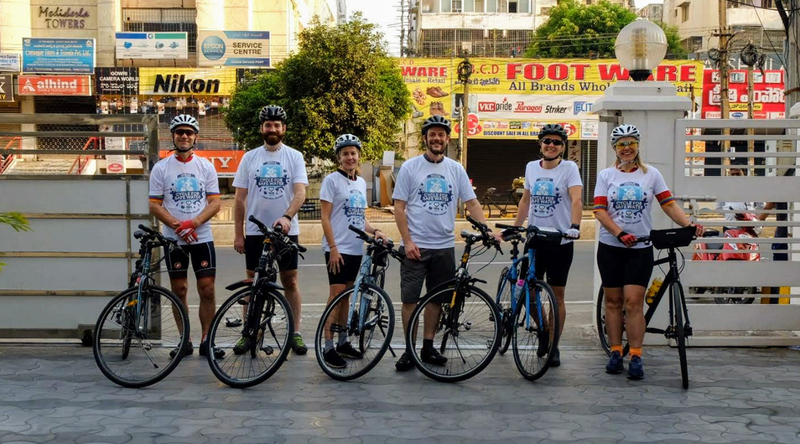 James Brook recounts his epic 400km cycle across India as part of FRANK Water’s Cycle for Safe Water. Legs aching from half a day’s cycling through the Indian mountains, we stopped our bikes just under a kilometre away from a remote village in Andhra Pradesh. We changed our clothes to cover up (especially the lycra), before heading down the dirt road towards the village to meet the locals. We suddenly heard a low din of music and cheer from the distance. One of the group excitedly exclaimed: “Look over there!”. We all turned to see a bustling procession of over a hundred people appear in front of us. It was a dazzling show of colour and sound. People were dancing and singing as they approached us, and we were welcomed with a sea of smiles. 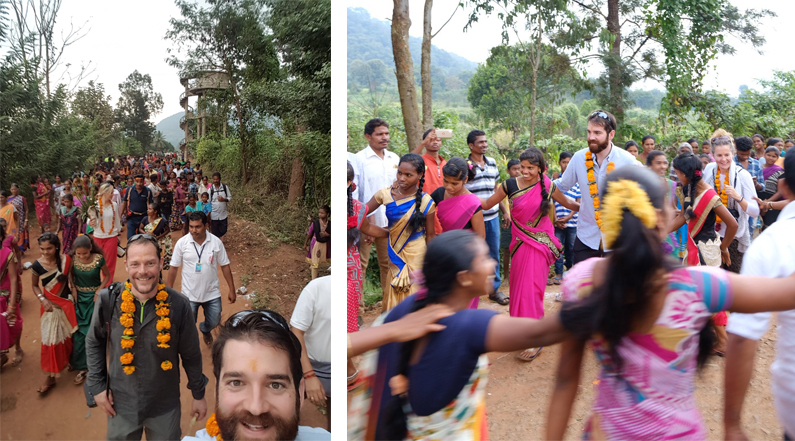 This was just one of the five amazing welcome ceremonies that we experienced during the Cycle For Safe Water through the Eastern Ghats mountain range of Andhra Pradesh. The charity cycle challenge in aid of Bristol-based charity FRANK Water was intense, knackering, enlightening, exciting, demanding, unrepeatable and overall a fantastic experience. The trip took place from 26th October to 3rd November 2018, beginning and ending in Visakhapatnam, Andhra Pradesh. This meant cycling out of, and then back into, an Indian city – with all the potential hazards you may expect! Being constantly alert was both a natural reaction and a necessity, only aided by learning the ‘rhythm’ of how traffic ebbs and flows to its own beat. 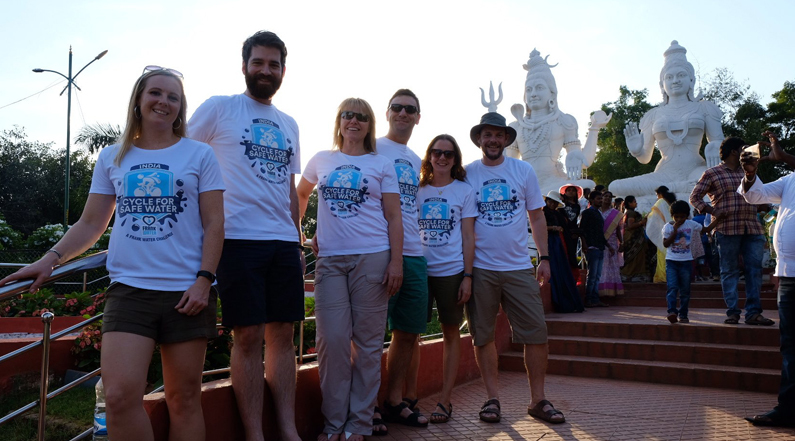 The focus of the trip was to raise both funds and awareness of FRANK Water, a charity that aims to provide safe drinking water to the 663 million people worldwide who still lack access to this basic human right. Worktribe have supported FRANK for a number of years, and our staff often volunteer at their events around the UK. FRANK Water use funds raised in the UK to lead projects in some of the most deprived communities in India and Nepal to help them secure safe, clean drinking water and sanitation, and sustain the government funding required to do so. It was some of those communities we had the opportunity to visit on the Cycle For Safe Water, to see first hand the impact of having access to clean water. One of the most eye-opening moments of our journey was experiencing first hand the stark contrast between two villages, mere kilometres apart – one having had access to clean water for over a decade, and the other, without. The prosperity of the former, along with the health and vibrancy of the community was difficult to stomach when compared to their near neighbours; where the outlook was drastically different. This really hit home the paradigm shifting effect that clean water can have, and it really is the driver for growth in these rural communities. And how no person in 2018 should be without access to such a basic natural good – something we take for granted in the UK. The local community experiences made the challenge of cycling 400km in the mountains and heat somewhat of a side show to the real challenge of everyday existence for some of the people we met. Whilst the physical side of the trip was in its own way exhausting, I was already a (fairly) experienced cyclist, so my time on the bike was actually respite and fairly tranquil. I had time to take in the sights, sounds, beauty and scenery (and smells!) of a region and country that was truly breathtaking. 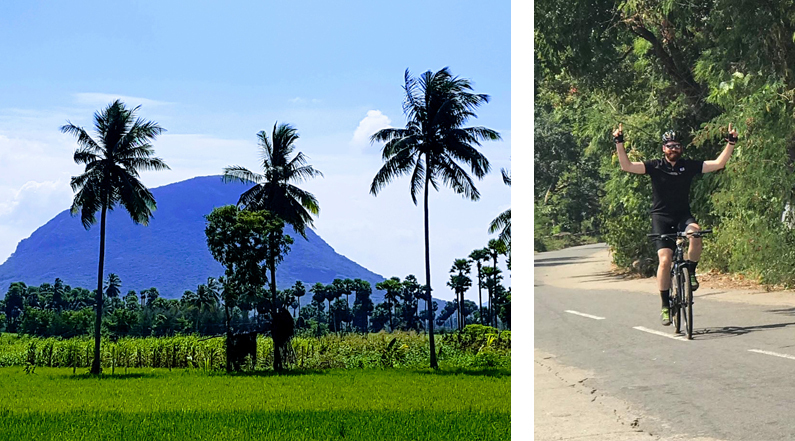 It wasn’t an easy ride by any stretch of the imagination – with hills up to 15km long, dirt roads, potholes, 3 lane traffic on single lanes – but I really enjoyed authentically experiencing India for the first time this way. The mental fatigue was the trickier thing to deal with, and thankfully my five fellow cyclists were a brilliant group who supported me and each other throughout. Sophie, Louise, Jane, Chris and Pete, I salute you. I couldn’t have wished for a better group to share this experience with! In addition to visiting a myriad of local communities, the trip also involved some of the following (to different degrees! ): Gravity fed water tanks under construction, temple visits, press calls and photoshoots, video-shoots, meetings with local dignitaries and police chiefs. And the food was great – curry for breakfast, lunch and dinner! Although we stuck firmly to vegetarian dishes. I came back and felt like I had gone through the wringer both physically and mentally, but I also felt surprisingly refreshed and rejuvenated. I met so many lovely people and my lasting impression of India was of a remarkably hospitable and welcoming place. This of course includes all the people that made the trip happen, including VJNNS, our support team, the tour operator (Authentica) and of course the team at FRANK Water – all of whom were brilliant to work with. FRANK Water have lots of activities for all ages and abilities to get involved with – so why not see out how you can make a difference? And…from midday on #GivingTuesday, 27th November until midday 4th December, every donation made to FRANK Water will be doubled! Support this small, dynamic charity and change twice as many lives here.